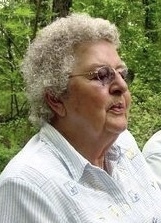 Irene P. Kidder, 88 of Elkhart, passed away on Saturday, Nov 24, 2018 at the Elkhart Hospice House after suffering a stroke. She was born Aug. 28, 1930 to Oscar and Thelma Dahl in Royal Oak, Michigan and was raised in Chicago. She married her devoted husband of 66 years, Richard S. “Bud” Kidder on June 27, 1952 in Elkhart. He survives along with a daughter, Vickie Kidder and (Perry) of Elkhart and a son, Richard “Tuff” (Alysjane) Kidder of Bristol; and grandchildren, Missy and Brian Pletcher with Lauren and Drew; Scott and Micki Kidder with Grace, Ben and Clayton. Many nieces and nephews with whom she is very close. She was preceded in death by her parents, a brother, Sonny Dahl and sister, Jean Dahl. Irene was a mom and gram and had worked for Switchboard Concern for over 20 years and was a radio dispatcher for the Osolo Ambulance. She had previously worked for C.T.S. Corp., Miles Laboratories, Coopers IGA and Burger Dairy Store. She also was a member of the Women of the Moose. She brought much joy and laughter to all the kids…everywhere. Visitation for Irene will be from 9 am to 11 am Thursday, Nov. 29th at Stemm-Lawson-Peterson Funeral Home, where her funeral service will be held at 11 am. Rev. Tom Miller will officiate. Burial will follow at Adamsville Cemetery. In lieu of flowers, memorial contributions may be given to the Humane Society of Elkhart County. Online condolences may be shared with www.stemmlawsonpeterson.com.